The time has come to remove the shutters from your brick home or structure. 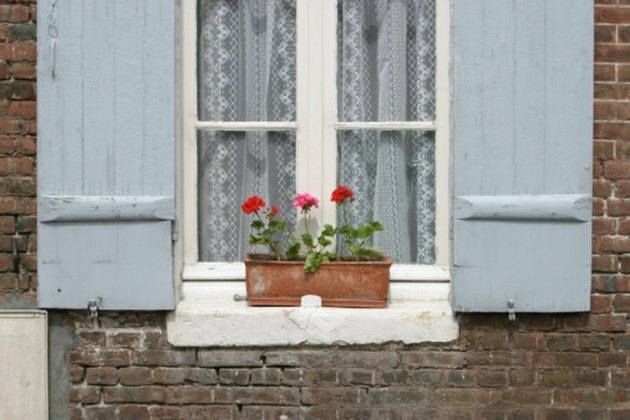 You may be thinking about repainting the shutters, totally replacing them with new shutters or nothing at all. Removing shutters from brick is not difficult and with a few tools and supplies, you will have the removal done in no time at all. Shutters need to be maintained and updated just as much as the rest of your home. Pull the bottom of the shutter forward slowly using a pry bar. Wear gloves and safety goggles for protection. Use a ladder to reach the shutter if you have to. Slide a pair of tin snips behind the shutter and cut the screws, nails or fasteners as close as possible to the bricks. Pull the top of the shutter forward slowly using a pry bar. Brace yourself if using a ladder to reach the shutter. Cut the screws, nails or fasteners as close as possible to the bricks holding the top part of the shutter. Pull out the cut screws, nails or fasteners, if possible, from the bricks using a claw hammer or tin snips once the shutter is removed. If you can't pull out a cut stub piece, hammer it in to the brick as much as possible. Wipe the area where the shutter was with a clean rag or shop towel to remove any dirt or dust. Fill the holes in the brick with some brick mortar or caulking that is designed for use on bricks.